The Clark Art Institute in Williamstown, Massachusetts, is renown worldwide for the size and quality of its Impressionist collection. Sterling Clark, an heir to the Singer Sewing Machine fortune, was highly discriminating in the pieces he chose to buy. He was entirely self-taught and relied solely on his own excellent taste, the input of a few trusted dealers and of the opinions of his wife Francine, a French-born actress who he described as his “touchstone in judging pictures.” The result was a collection of such depth that it eclipsed in quality the collections amassed by his wealthier contemporaries. He kept it all on the down low, collecting for decades in the background, never publishing, promoting or displaying his artworks until th opening of the Clark Art Institute in 1955. Out of nowhere, it seemed, and set in a small college town in the remote Berkshire Mountains, one of the greatest private collections ever pieced together exploded on the scene. The Impressionists, the main focus of Sterling and Francine Clark’s acquisitions after 1920, made the most lasting impression overall, but the Clark also has a phenomenal collection of paintings from the 14th century through the 19th, decorative arts, Remington bronzes, porcelain and British and American silver. Its location next to Williams College was not a coincidence. From the beginning, the Clarks evisioned the museum not just as a venue for the display of their flawless collection, but as a hub of art historical research and education. The museum sponsors the college’s world-class art history graduate program have developed a truly symbiotic relationship that has produced curators and directors who have worked in the greatest museums in the country and internationally. The Clarks’ judiciously ecclectic approach has continued in the museum they founded. The permanent collection has grown significantly since 1955 as the Clark Art Institute very selectively acquires pieces to flesh out certain areas, time periods and subject matters. One of its latest acquisitions is the Portrait of Achille Deban de Laborde (1817) by Alexandre-Jean Dubois-Drahonet, a French portraitist who may not have the highest name recognition today, but who was preeminent in his field and specialized in studies of military uniforms, several of which are now in the collection of Windsor Castle. 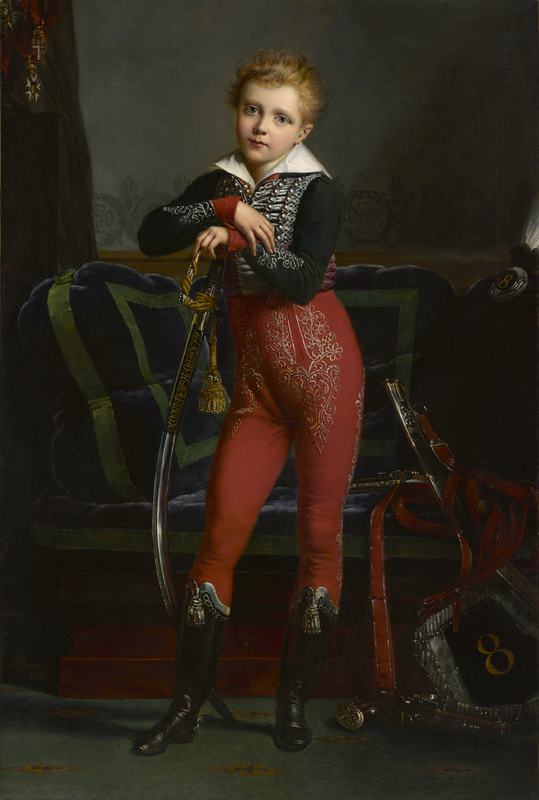 Purchased at auction this past April for $295,500, far above its pre-sale estimate, it is a full-length oil on canvas painting of a boy dressed in full Napoleonic military uniform. 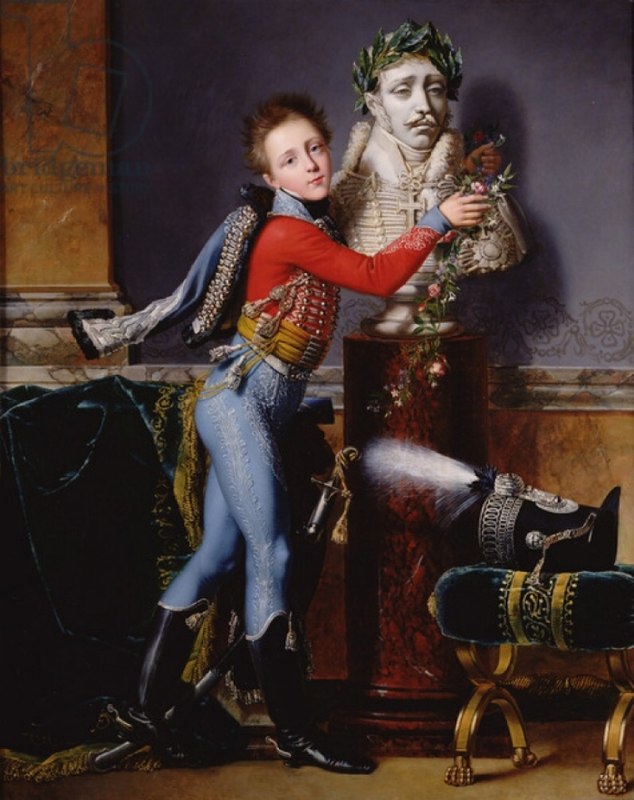 The striking garb and composition of the portrait is a tribute to Achille’s father, Baron Jean-Baptiste Deban de Laborde, a First Empire Hussar who was died in combat at the Battle of Wagram in 1809. His son was just one year old at the time. Seven years later, he sat for a portrait wearing a child-sized version of his father’s uniform with its characteristic silver frogging and wee tasselled hessian boots. The youth leans on a ceremonial sword his father was given as an award for bravery as squadron leader at the Battle of Marengo in 1800. His sabre and its scabbard are on the floor on the lower right. Pinned to the velvet drapery in the upper left of the painting is the late baron’s 1804 Légion d’honneur medal, among others. On the couch behind Achille are Jean-Baptiste’s plumed shako cap and sabretache (a pouch worn on cavalrymen’s belt). The cap bears the number 8, Jean-Baptiste’s hussar regiment. Dubois-Drahonet primarily worked as a portraitist but also produced a number of studies of military uniforms. His work was notable for its clean lines and a command of light similar to that of his contemporary Jean-Auguste-Dominique Ingres. Drahonet exhibited at the Salon from 1812 to 1834 and was awarded a medal in 1827. 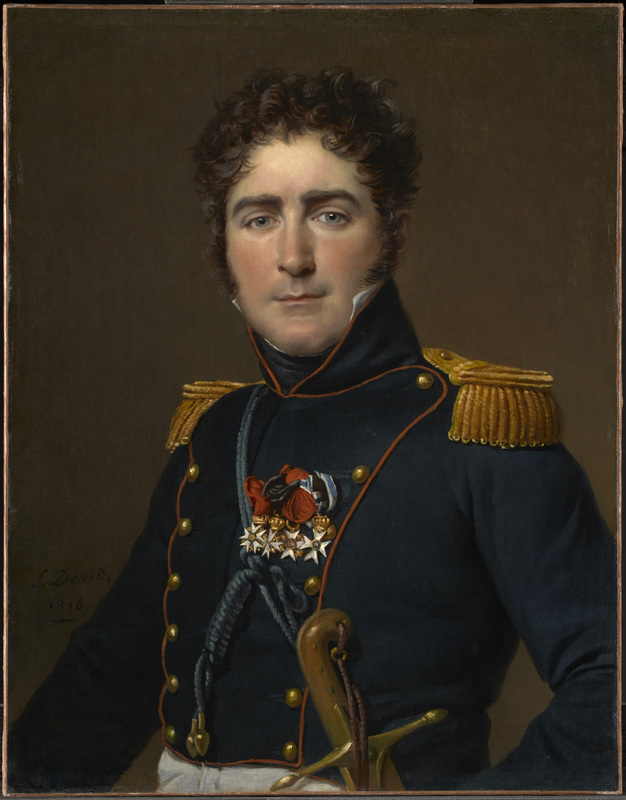 The portrait of Achille Deban de Laborde combines Drahonet’s talent for portraiture with his detailed knowledge of military uniform and accoutrements. They took it twice, in fact, because that same year Achille’s older brother Edouard-César Deban de Laborde was also immportalized in a portrait by Dubois-Drahonet. The son and heir is even more elaborately kitted out in uniform as he wraps a garland of flowers around the laurel-crowned marble bust of his noble but sad father. When he grew up, Achille, like his father, chose a military career. Also like his father, he rose to the rank of colonel, although not in the Hussars but the Fourth Cuirassiers Regiment. When his brother Edouard died without issue in 1851, Achille inherited his father’s title too. 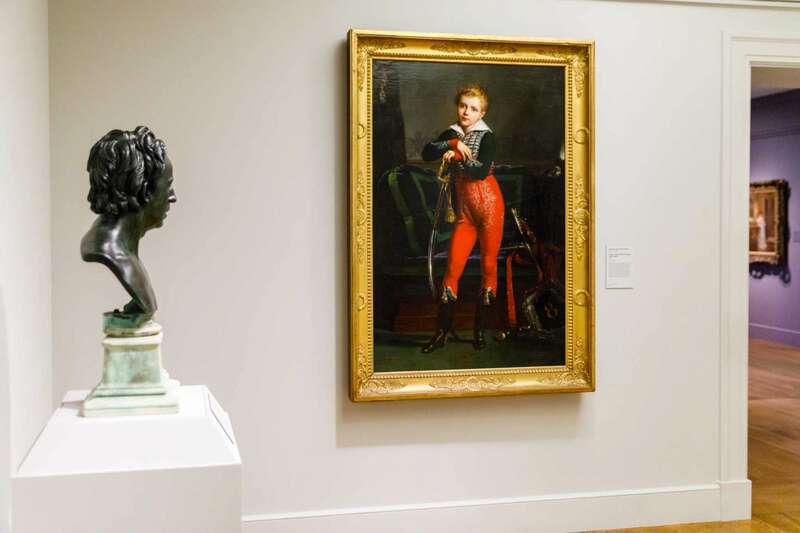 After it was bought from a Belgian private collector by the Clark, the Portrait of Achille Deban de Laborde spent a few months getting some love from the experts at the Williamstown Art Conservation Center. They found it in exceptional condition, its canvas, stretchers and frame all original. It just required a thorough cleaning, the removal of a discolored varnish layer (not applied by the artist) and a few fill-ins here and there of small spots where the paint had flaked off over the years. After 65 hours of conservation work over the course of weeks, the beautiful portrait was ready for primetime. It is now on display at the Clark with other early 19th century works. This entry was posted on Monday, November 27th, 2017 at 11:55 PM	and is filed under Modern(ish), Museums. You can follow any responses to this entry through the RSS 2.0 feed. You can skip to the end and leave a response. Pinging is currently not allowed. The mess that Napoleon left larger parts of Europe in was not over by then. A couple of years ago, I acquired an old print for three bucks (obviously French propaganda) that I scanned and digitally translated (hence, the translations reads a bit machine-gunned). I don’t know any art collectors but I had assumed until recently that many were just rich twerps who cultivated publicity. My mind has been changed somewhat by one of the Saatchi brothers. He has been writing a weekly art column in the Telegraph, illustrated each week with a large photograph of a relevant work. This week he has written about Whistler and the photo is of, inevitably, the painting of his Ma. Saatchi may well be a rich twerp but if so he’s a rich twerp with a real interest in painting.